Windows and Xbox games will receive a significant graphics and performance boost with Microsoft's new DirectX 12, a set of application programming interfaces and tools used in PC games. Users can expect better-quality games with DirectX 12, Microsoft said Thursday. The company announced DirectX 12 at the Game Developers Conference in San Francisco. 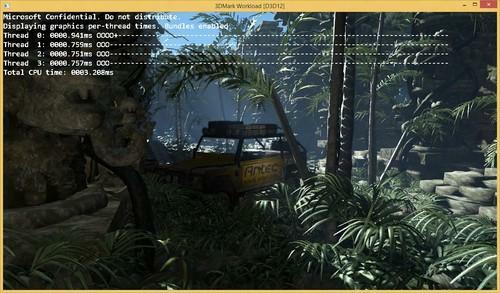 DirectX tools work in the background to power games on PCs, tablets and smartphones using Windows operating systems. DirectX 12 will also be used to author games for Xbox One. Most games are already based on DirectX 11, but higher-quality games based on DirectX 12 will be out by the end of 2015, Microsoft said. One of the most important updates in DirectX 12 is Direct3D 12, which "enables richer scenes, more objects, and full utilization of modern GPU hardware," Microsoft said. DirectX 12 will work across all Microsoft devices and make game programming easier. It will harness the computing power of graphics processors and CPUs to deliver better gaming quality. The company demonstrated the "Forza Motorsport 5" game at GDC to show the improvements in multicore GPU utilization by DirectX 12. Microsoft also said it would "abstract" hardware, which would make it easier for programmers to write games. In essence, DirectX 12 will make the CPUs and GPUs transparent and programmers will have to worry less about writing code to specific hardware. However, most graphics rendering is done through GPUs, so Direct3D 12 has new pipeline, execution and rendering features that make processing via GPUs more efficient. Users won't have to wait to buy new hardware to support DirectX 12, Microsoft said. More than 80 percent of gaming PCs being sold now will support DirectX 12. Nvidia, Intel, Qualcomm and Advanced Micro Devices announced support for DirectX 12 before it was announced. DirectX 12 will compete with AMD's low-level Mantle API (application programming interface), which is designed to take advantage of specific features in its Radeon GPUs to deliver a better gaming experience. However, AMD has said it will fully support DirectX 12. Graphics chip maker Nvidia has its own low-level APIs, but said its latest graphics cards will support DX 12. "Our work with Microsoft on DirectX 12 began more than four years ago with discussions about reducing resource overhead," said Nvidia spokesman Ken Brown in an email. In addition to working closely with Microsoft, Nvidia has provided drivers and a DirectX 12 development kit to more than 15 game developers. Developers have been asking for a leaner API that allows them to control hardware resources while extracting more performance from GPUs, Nvidia said Thursday. "DirectX 12 was designed from scratch to provide the infrastructure for these advanced applications," Nvidia said. Microsoft will share more details on DirectX 12 at the Build 2014 conference in San Francisco early next month. Meanwhile, game developers can sign up for an early access program to get DirectX 12 tools.